Planned Rides with Ride leaders: Routes were designed to be as flat as possible. No scheduled rides are planned for after we eat. Make plans with your riding friends while eating. Newer members are encouraged to come out and experience RBC friendship, meet other rides and or course, RIDE! This will provide a setting with RBC Bike Routes that many club members are familiar with, from short easier rides to much longer and hilly rides. Feel free to come out any time during the day and ride. 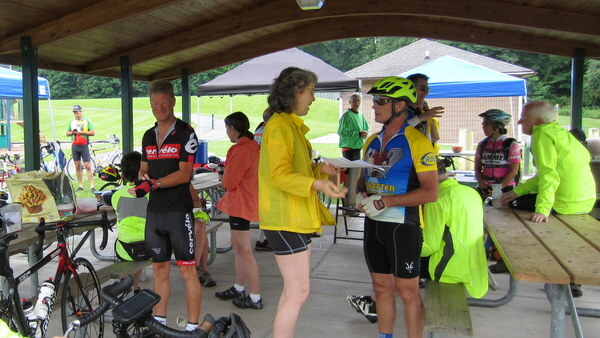 Entrance fee for the Challenge Ride is – Bring a dish to pass for the picnic at 1:30 PM. What is the Challenge Ride? It is a great day for the RBC to gather in one place for many different types of riding. You can ride 12, 25, 50, 100 or any number of miles during this daylong event. This is the day when you can challenge yourself to ride a little further than normal, of maybe even set a personal best for distance ridden in one day. Or it can be a day where you come out to do a comfortable ride and socialize with other riders. There are no other RBC rides scheduled except those at the Challenge ride on this great day for riding. Once again this year the club will be providing hot dogs and condiments and we request those coming to the ride to please bring a dish to pass. We would like to gather for a picnic around 1:30 PM. After that you can go out riding again to work off those picnic calories. We will fire up the grill around 1:00 and a volunteer will do the cooking. The Club will provide hot dogs, rolls and soft drinks and water. Of course if you are not into hot dogs, feel free to bring the meat of your choice to grill. Again the picnic will be about 1:30 PM. RBC Jerseys and RBC T-shirts will be available for sale. The Challenge Ride was first held in 1989, organized by Mark Frank. Andrew Spiller was a great long distance rider who was tragically killed in June 1992 when he was hit by a car during a very long endurance ride. Andrew was an RBC member and contributed to the club in many ways. The Challenge Ride was renamed in memory of Andrew. For 26 years the event was held at the Farmington Town Park. This would be a great day to come out and ride and honor Andrew. Let’s set a new rider attendance record this year. If you have another ride that you would like to lead out of the park during the Challenge Day, Get some riders together and go for it. If you have any questions, suggestions or would be willing to help out please contact Mark Robbins.